Preheat oven to 350. Butter or spray (with cooking spray with flour) a 9-10 inch springform pan***. 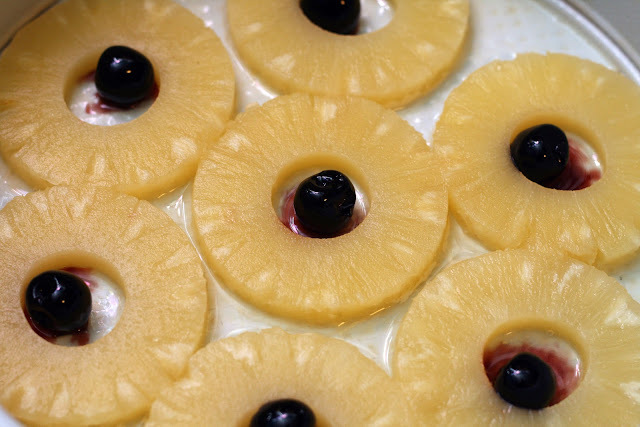 Arrange pineapple rings on the bottom of the pan. Add a maraschino cherry to the center of each ring. Set aside. In a small saucepan, melt and stir together butter, brown sugar, rum and corn syrup. Cook over low heat about 5 minutes or until it thickens slightly. Stir thoroughly to combine. Pour over the pineapple rings. Set aside. Cream together the softened butter and sugar in a large bowl. Add the eggs and vanilla paste and beat until flour. Whisk together the spices, baking powder and flour in a medium bowl. Whisk together the pineapple juice and rum. Add the dry ingredients alternately with the pineapple juice mixture beginning and ending with the dry ingredients. Pour into the pineapple and caramel laden cake pan and bake 45 minutes or until a toothpick inserted in the center comes out clean. Allow to cool in pan 5 minutes then invert onto a plate. Cool completely, on the plate, over a wire rack. *If you can find them, Luxardo Maraschino Cherries are well worth the extra price. They are miles away from the syrupy, garishly red cherries found in the supermarket for $1.50. **I used White Lily flour which, while not quite cake flour, is slightly lighter than all-purpose. ***Traditionally, pineapple upside-down cakes are made in cast iron skillets. I don't have have a 10-inch skillet (and my 12- and 14-inch skillets seemed too big) so I used a springform pan, which I think works just as well. Another recipe I created for our annual "decade" themed meal(s). This year it was the 1920s! 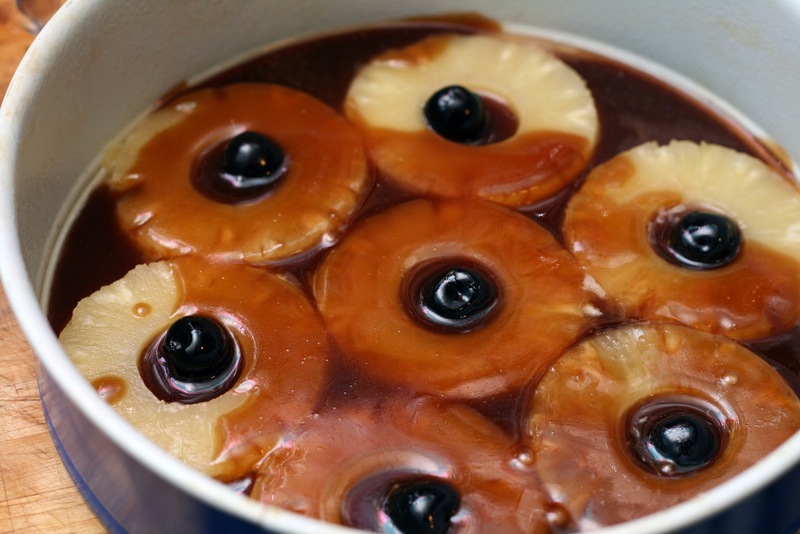 Pineapple upside down cakes exploded in popularity during the 1920s. Thanks to Dole, canned pineapple was readily available. 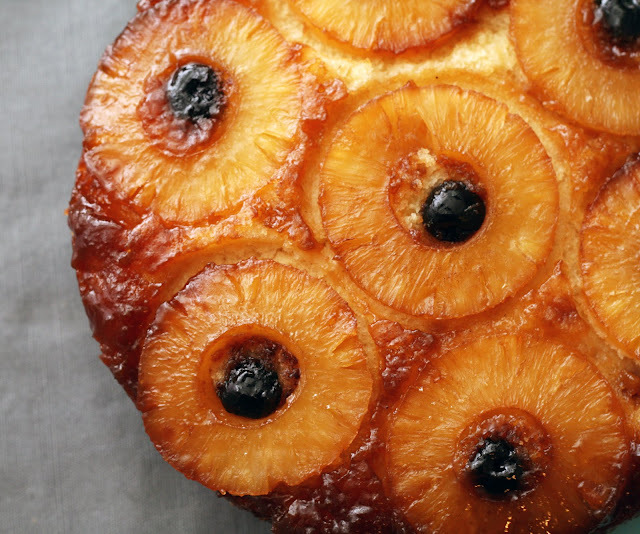 Upside down cakes made in cast iron skillets had already been popular for many years so it made sense that when the average person had access to pineapple, they'd incorporate them. Upside down cakes are wonderful to serve because despite being relatively simple, they are impressive and cheerful looking when presented. They can also be made a day ahead of time (stored unrefrigerated) and need no icing, which is great for any last minute dessert needs. I'd think most people have all of the ingredients in their cabinets at all times. I know I do. For this cake, I made a dark rum caramel sauce for the "topping" and used fancy maraschino cherries which taste amazing, and actually like cherries. I added a bit of cardamom to the cake as so many '20s recipes did but much less than some recipes I've seen that call for 2-3 and even 4 teaspoons of cardamom. That seemed a bit much. One teaspoon is just enough, I think. If it really was the Prohibition era 1920s, I might not be able to get my hands on actual rum so feel free to sub in some good quality rum flavoring instead. The 1920s was when the use of vanilla and other extracts rose and became common place. I also used some yummy vanilla paste by Heilala Vanilla instead of extract and the cake was flecked with tiny vanilla seeds. The cake itself is simultaneously dense and light, substantial enough to hold up the topping without getting soggy (even after a number of days) but with a light crumb and flavor. I think this is because I used a lot of baking powder and it sort of rose high then gently fell during the baking process. I have to say, this is quite possible my husband's favorite cake of all that I've made over the years. He could not stop raving about it and has requested that a version of it to make an appearance at his birthday in May. It really was a pleasure to eat. I can see why they were so popular!